Why Do Birds Flock in Fall? At the end of the summer, you may start to see large flocks of birds. 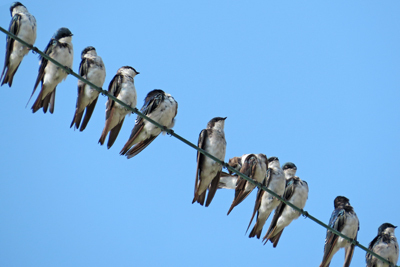 Swallows, blackbirds, cowbirds, sparrows amass — sometimes in large flocks that seem to come out of nowhere and then just as mysteriously, disappear. But why is this? And why don’t we see it at other times? In the summer, most birds maintain a territory, and they defend it from other birds of the same species, making for less opportunity and desire to be in a flock together. Once the breeding season ends, birds start to gather for a number of reasons. A main one is that flocking has its advantages. Small birds on migration may be easy pickings for predators. But gathering together gives them some protection from hawks. They can have more eyes on the landscape for an early warning for others. And there is a certain safety in numbers, as large flocks can confuse predators, making it difficult for them to pick off individual birds. With food at a premium during migration, a windfall may cause birds to gather around a communal resource. For example, Sandhill Cranes gather together in agricultural fields to eat the left-over grain after the farmers have harvested. It’s hard to tell if they mind sharing, though it’s common to see cranes get into little spats with each other if one gets too close to his neighbor. And, birds flock sometimes for the same reason humans end up in traffic jams — it’s not because we like sitting in traffic, it’s because we all are going to the same place! On migration, with lots of birds going the same direction, there can be a pile up. For example, if a wind coming from the west pushes birds towards the east coast, you’ll run into a large flocks of birds on the coastline. Similarly, if hawks are using the wind from a ridgeline to aid on migration, you will see a large number of hawks on that ridge. Buteos, such as Broad-winged Hawks, may need help locating thermals, which aid in migration. But, thermals are rising columns of warm air, which are invisible! The best way to spot them is to look for other birds riding a thermal and Broad-winged Hawks help each other find these thermals on migration. When you come across a flock of birds this fall, try to determine why they are together. It’s an interesting way to understand more about the birds in your area.